Kathryn Gretsinger is the lead instructor in the School’s Integrated Journalism program. She also contributes to the International Reporting program and the Reporting in Indigenous Communities course. She also runs the School’s Internship program. Kathryn’s career in journalism began in the late 80s when she joined the Canadian Broadcasting Corporation (CBC) Canada’s public broadcaster. Kathryn is committed to public service journalism and she has worked to develop her journalistic skills to reflect the technological change in the industry. She works across platforms, but her first love is audio. Her documentaries, programs and interviews have been recognized locally and nationally. 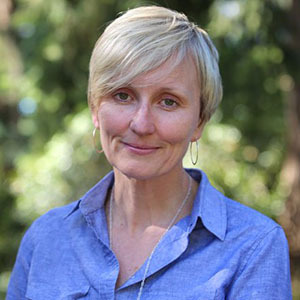 She frequently guest hosts radio programs at CBC and continues to work with reporters, producers and editors to train journalists in audio storytelling techniques. Kathryn’s commitment to the industry is reflected in her approach to the internship program. She has helped to place students in professional practicums across the country and around the world.